Allen County Hospital is a 25-bed acute care facility located in Iola, Kansas, approximately 90 miles south of Kansas City. The 104 active member medical staff features primary care physicians and specialists in general surgery, radiology and urology. We have been honored with awards of excellence for the care we provide: Kansas Critical Access Hospital and an Accredited Clinical Laboratory by the College of American Pathologists and CLIA. Our team consists of 165 skilled employees who staff the hospital 24 hours a day, 365 days per year. Volunteer groups include the Allen County Hospital Auxiliary, Red Cross Volunteers, Junior Volunteers, Lifeline Volunteers, and Hospice Volunteers. 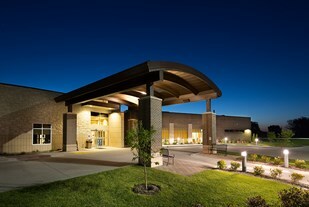 As a hospital, we serve the communities included in the Allen, Woodson, Neosho, and Anderson counties. Services include: Emergency Services, Gastroenterology, Home Health/Hospice, Intensive Care Unit, Laboratory Services, Orthopedics, Pulmonary and Respiratory Services, Radiology/Imaging Services (CT, Breast Imaging Center, MRI, Nuclear Medicine, Radiology, Ultrasound), Rehabilitation (Inpatient, Lymphedema Care and Treatment, Occupational therapy, Outpatient, Physical Therapy), Sleep Lab, Specialty Clinics (Allergy, Cardiology, Otolaryngology (ENT), Immunology, Mastectomy Options, Neurology, Oncology/Hematology, Pain Management, Podiatry and Urology). This primary care facility offers quality healthcare in a small town environment. Work and live in a community where housing is affordable. Schools are ranked 4-A in a state school system that ranks among the top five nationally. Iola also has two private Christian schools and a junior college. The community is proud of its winning athletic program, the library, a recreation center, fine arts center, and municipal swimming pool. The industrial base is diverse and stable, keeping employment high. This is an ideal environment in which to raise a family. Iola is a short, scenic hour and a half from the suburbs of beautiful Kansas City including Johnson County with its wonderful array of shopping, fine restaurants, and cultural activities. Kansas City is also home to a NASCAR racetrack and numerous professional sports teams.